I always did play it safe. For different reasons I was not prepared to step out of my comfort zone; however, I never felt content at all. I always wanted more. I wanted to feel the risk and would go looking for it, but in ways that wouldn’t really help me move forward, like bungee jumping or other risky activities. I lacked self-awareness, which was keeping me from gaining perspective so I could actually make a big change in my life, such as leaving my job or travelling long term. I didn’t know what my fears were or what they were stopping me from. Therefore, I lived for many years in these unfulfilling routines that would slow down or glaciate my development. I want you to have the opportunity today, to take the first steps that will support you in managing one of the factors that is most likely keeping you stuck. Are you living in the Comfort Zone? 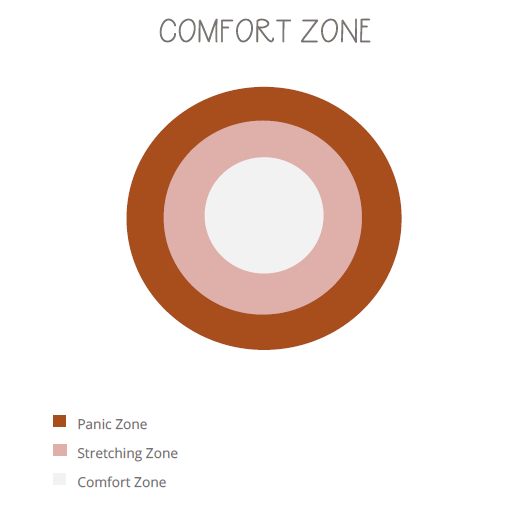 You have probably heard the concept of “The Comfort Zone” before and how it relates to fears. However, have you thought about how it relates to you in the specific? In case you haven’t heard about it before, it is related to the levels of anxiety that we feel in different circumstances. For instance, you will experience situations that are familiar and simple to carry on; you are used to them, and they are easy to be managed daily. These situations fall into your comfort zone and your anxiety levels will be mainly low when faced with them. In other occasions, you will face newer circumstances where you need to develop skills to deal with the challenges or opportunities that may come up with them. Those would be fit into the stretching zone, and your levels of anxiety would be medium. This is the place where you want to be, this one is going to help you grow and develop. Finally, you could encounter situations that you have no idea how to handle and that generate high levels of anxiety that may prompt you to react, freeze or run away from them. This would land in your panic zone. It is important to know the zone you are stepping into when you look at your life and try to accomplish a goal or a dream. The first thing to do is to ask yourself what those zones mean to you, how would you describe them and where you are at when you think about that goal which you want to achieve a year from now. This exercise is explained further on the downloadable workbook that I have created for you as a gift when subscribing to the newsletter, so you can gain perspective and make notes of where you are at and how you can move from the panic zone to the stretching zone. Have you define your fears and doubts? Every time that you set a “big” goal or objective, you will probably be stepping out of our comfort zone. If this is not the case, you might be playing it safe or, have a great plan that will move you steadily towards it. On each occasion where you step out of your comfort zone, you will find that doubts and fears will crop up and will make you double think what you are about to commit to, or you have already committed to. So, when you think about your big goal or objective, what does your mind tell you? Is it encouraging you to follow it? Or, is it draining your motivation and destroying your commitment? What words does your mind use when speaking to you? Writing those down will give you a new perspective; you can use the editable workbook for this. Those thoughts represent your fears. Fears that are rooted in your beliefs about yourself, about the world and about others. It is highly important to create awareness about your fears as a first step. They are one big factor that could be stopping you from moving forward in your career, when connecting with others, or perhaps when trying to be yourself and showing to the world who you really are. There are a lot of tools and techniques that will encourage you to push away your fear. People will sell you the possibility of being FEARLESS. It is a nice perspective, but it is not evolutionarily possible from my point of view. As humans we feel fear, it is such an incredible mechanism that keeps us alive, that helps us judge whether a situation is dangerous or not, whether we need to act or run away. It is one of the main reasons I do not see the possibility of living without it. The danger resides on your willingness to spend time gaining perspective, processing, managing and negotiating with those fears. If you are not willing to do so, they will hunt you over and over again. You might have tried your hardest to find tools such as positive thinking, distraction or visualisation to deal with fears. Perhaps you have put them into practice repeatedly and found out that the effect does not last. Self-doubts keep popping up. The big problem is that you might start to be harsh on yourself because it does not seem to work. What is it that you are doing wrong? Your mind might tell you. You might focus on “your lack of capacity or ability to do it well” when in reality the expectation of not feeling fear or having doubts is unrealistic. The key is not to blame yourself. Use the tools. Some of them are great as a short-time management technique. However, if they don’t work be compassionate, they might well not be the right techniques for you at this point. Make a plan. Befriend your fears and negotiate with them. Different fears will knock on your door, but they will only sit down and let you do your thing when you have invited them for a cup of tea and talked to them face to face. They will stop hunting you when you look them in their eyes and share with them the reasons why you want to go ahead with your objectives. Negotiate with them the best ways you can manage obstacles to keep them calm. When you start to hear the “knock knock” on your front door (this only applies to polite fears), let them in. Try to understand what type of fear it is and where that fear is coming from. Find out what its concern is about and work together, plan out the steps that you can take to keep moving forward. What is the first thing you have to think about that will give you more confidence in moving a step forward? What else? Go through these questions and much more in the workbook that you can download by becoming part of the community here. Then, once you have discovered where to start by, do it. Remember, the keys are awareness and understanding of where you are at and what fears are holding you back. Remind them of your dreams and whys. Work together to find a way that you can prepare yourself to hit your target. You will learn and grow greatly when you are willing to observe, listen and negotiate with your fears and doubts. This will help you to keep progressing and developing not only in the area of your life that you are working on but also in life overall. Join The Confidence Hub here to learn more about how to deal with your fears and get support on your journey to success!